LED pillow promos – advertising in the dark! 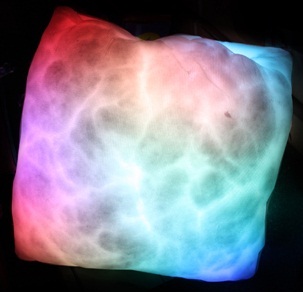 The moonlight pillow is not a conventional pillow, the unique characteristic of the changing light color makes this product unique and highly innovative. The pillow is made from soft plush fur which makes it very comfortable and it was a great hit at recent houseware show.. It can be used either indoors or outdoors, although it is best if used during night time or in dark areas in order for the lighting to be more visible. This can be a great item for interior decoration or to capture people’s attention during a night party – a great promo item for drinks companies. The light source is powered by pressing the center of the product. A battery pack is tucked away in the center of the pillow, accessible by a zipper compartment. Light of the pillow comes from an LED source providing bright and safe low energy lighting. The internal LED light source can change colors continuously giving out a very cool lighting source as the pillow changes from one color to the other. As you can see in the picture to the left the pillow can even display several colors at the same time. This LED pillow is a great product for decorative or party related promotional campaigns. Customizing this product is easy and printing logos on the pillow could really drive sales – care needs to be taken on product design though as lighting display needs to tie in well with the logo. Customization options to make pillow a different shape colour are a dream for marketeers. 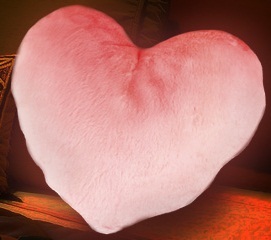 Above LED pillow in the shape of a heart makes a great product for Valentine’s Day. Contact us for questions regarding manufacturing and possibilities to customize the moonlight (LED) pillow. LED Lighting & advertising signage.